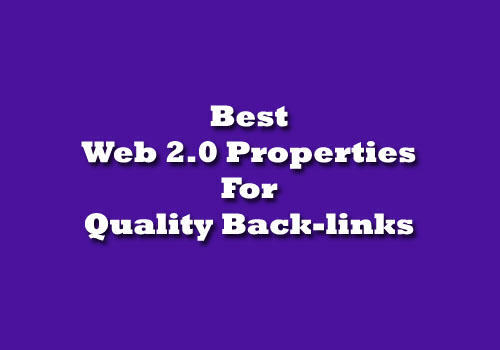 This Web 2.0 properties list 2016 is for everyone who want to create quality back links for their money sites. Even though now Google Search Algorithm is more about fresh content than back-links still you can get points to gain position in search results if you gain back links in proper way. Anyway if you know this all story then just go blow and get the updated list. If not you might want to know why these Web 2.0 links are important for your website and How it should be get done. Even though backlinks are important, these days we have to be very careful when we trying to get links from other sites. Spammy links can do more harm than any good to your site. Guys at Google search are very mean these days you won’t get a much chance if you screw up your back-link profile. Either you have to clean the whole profile and start from begin or worse you might end up no choice but abandoning the whole site. So the best thing you can do is keeping control of all 1 tier one back-links to your site. Means ability to remove any link which might be harmful to your site. This is why it’s better you make back-links of first tier by your self rather than trying to link other sites directly with your money site. Why Web 2.0 properties ? You can create black links for any site you want but these web 2.0 sites usually have better rank in Google and you might get something out of it. For example Blogger.com and WordPress.com are wel known authority sites and let you create your own blog using their platform. So you get black links from these great name and also you have total control over the content and changing link if you need to remove it later. 19. Livejournal.com – NoFollow & NoIndex but sometimes visible in Google tools. 26. Snappages.com – Even thought they say 14 day trial you get keep it (at the moment).